Dan Skelton won the Randox Health County Handicap Hurdle for the third time in four years as Ch'tibello powered clear up the Cheltenham hill. After Superb Story in 2016 and Mohaayed 12 months ago, Ch'tibello now has his name on the roll of honour. Having run in the Champion Hurdle last year, his class was not in doubt - but he had not been seen since finishing second at Aintree in December. Since then he has had a wind operation and it has obviously worked, as jockey Harry Skelton moved ominously through the field on the turn for home. We Have A Dream and Countister still had a chance, but Ch'tibello (12/1) flew up the hill to beat top-weight We Have A Dream by a length and a half. 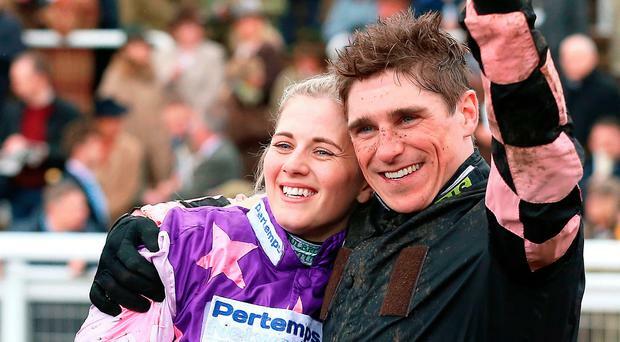 Dan Skelton said: "I told Harry to go out and ride the horse as if he had 10lb in hand because I'd never had the horse so well, and everything worked out. "I love the County Hurdle and it's been such an important race for us. I knew he was more than up to that level." Harry Skelton said: "The man I ride for (brother) is a very good trainer and just as good a man. "He told me we were in the right place with this horse. He told me to go out and enjoy it and the horse gave me a great feel. He was gutsy at the end." The brothers are sons of showjumping great Nick Skelton, who said: "Credit to Harry, who gave the horse an unbelievable ride." Hazel Hill (7/2) came with a well-timed run under amateur rider Alex Edwards to take the St. James's Place Foxhunter Challenge Cup Chase. "Unbelievable. I love this horse. He's run 15 times and won 14 of them," Edwards said. "I'm in a very lucky position to ride these horses."